GGC Foundation: An independent, non-profit public foundation which oversees the GGCurrency system. 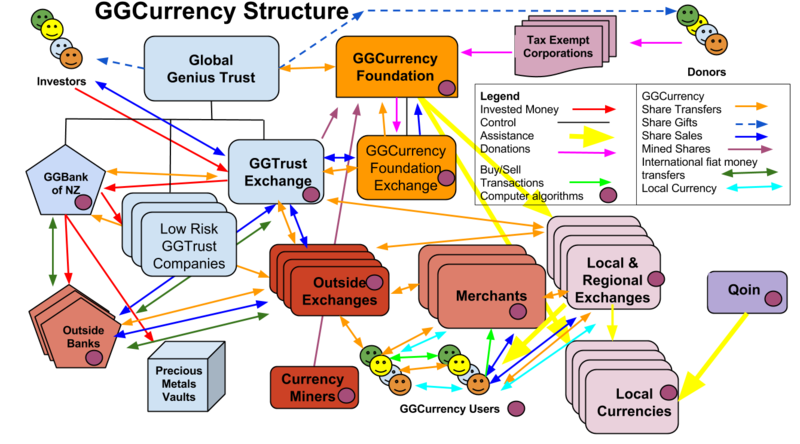 In this diagram, it also represents the GGCurrency system/network in general. Foundation-owned exchange: Since the GGC Foundation cannot conduct business as a matter of course, it owns an exchange in order to buy and sell GGCurrency and other currencies. This is probably not a very large exchange, as there will be other exchanges to provide the same function. Non-GGTrust Exchanges: GGTrust and the GGCurrency Foundation will encourage other currency exchangers to include GGC in their basket of currencies. Computer algorithms: The Ethereum computer protocols which create and use GGCurrency will be open source and available for anyone to use. They will reside on hundreds or thousands of individual computers, operating as a network. The algorithms running on computers are represented by a dark magenta dot. GGCurrency Mining: GGCurrency is created by performing complex mathematical calculations. These calculations are performed by all computers in the GGCurrency network, but some members of the network will chose to provide specialized faster and more powerful computers which are specially designed for these calculations. They will produce a significantly greater number of GGCurrency than the ordinary user. Pre-launch mining licenses will be available, which will take advantage of the relative ease and greater productivity of initial mining efforts. Global Genius Trust: The sponsoring organization for GGCurrency. At least one class of GGTrust shares will be available to be used as currency in the GGCurrency system. Currency Trade/Share Sale Exchange: GGTrust will own at least one currency exchange to facilitate the sales of GGTrust shares into the GGCurrency system. Tax Free Entities: US Government (and perhaps other government) registered non-profit entities will serve as portals for donor money into the GGCurrency system. Donors will be able to claim tax deductions for donations to these non-profit entities. Funds earmarked for the GGC Foundation may be donated to GGC Foundation, at the free will of the receiving non-profit entity. Donors: Donors who are not investing to obtain equity shares may obtain US tax credits by donating through a registered 501c3 or 4 tax-free entity. Donors may receive gifts of GGT shares or other gifts as a token of thanks from GGTrust. Investors: Equity Investments in the GGCurrency System will receive Shares of GGTrust and/or other items of value. For example, an investor might initially receive a Certificate of Financial Interest in GGTrust. After certain milestones, such as launching of the GGCurrency System, the investor might be gifted with GGC notes of similar value. This kind of equity sharing might be repeated when other milestones were met. Local Currencies: Complementary currencies of various types will be eligible for trade within the GGC system. Qoin: Qoin.com is a designer and proponent of local complementary currencies. We will work with Qoin to design a model local currency, and to design variations to meet local needs. Local, state, national exchange centers: Exchange centers will serve the users of local currencies for training them, coordination and recruiting of merchants and users, and integration with the systems of GGCurrency and national currencies. Merchants: at the local currency level are recruited and trained to integrate the local and GGC currencies into their usual business operations. Banks: Banks will interface with local and GGCurrencies at local, national and international levels. Local banks and credit unions may choose to provide integration services for Local Currency members. GGBank of NZ: GGTrust establishes at least one international bank. GGBank will be a New Zealand Financial Services Company, not a licensed bank but authorized and able to provide all banking services. GGBank will be a major point of integration between the GGCurrency system and the international SWIFT and BRICs banking systems. At some point, it will be advisable to control more than one bank, to increase survivability and decrease the vulnerability of attack at a single chokepoint. Precious Metals Vaults: Gold, silver and other precious metals will be held in segregated accounts in international storage vaults as assets to back the GGCurrency. Comparable storage of oil, grain and other commodities may be implemented as well. Donation Money: Donations to participating non-profit organizations, which is earmarked for subsequent donation to the GGC Foundation. Pink Arrows. Share Purchases: Purchases of GGCurrency and Local Currencies can be accomplished at the various system or external exchanges or at participating merchants. Blue arrows. Share Gifts: GGTrust and the Local Currency Governing Board may choose to gift currency shares in gratitude to donors who have earmarked their donations for the GGC system. Blue dashed arrows. Investment Money: Investments for profit into the GGCurrency System will receive Shares of GGTrust and/or other items of value. Investment money and stored assets are represented by red arrows. Mined GGCurrency: The flow of mined shares and other new GGCurrency into the system is represented by dark purple arrows. Local Currency: Local currencies will be used primarily in their local areas. Some local currencies will be designed to be interchangeable directly with GGCurrency. Many more local currencies will be able to be exchanged with GGCurrency and perhaps other currencies. Cyan arrows. Buy/Sell transactions: The green arrows designate buy/ sell or mercantile transactions. Share transfers within the GGCurrency system are represented by orange arrows. International Fiat Money Transfer: Bank wire transfers using national currencies are represented by dark green arrows from bank to bank.